Snee playing in the 2011 NFC Divisional Game. Christopher Snee (born January 18, 1982) is a former American football guard who played his entire ten-year career for the New York Giants of the National Football League (NFL). He played college football for Boston College and was chosen by the Giants in the second round of the 2004 NFL Draft. Snee earned two Super Bowl rings with the Giants in Super Bowl XLII and Super Bowl XLVI, both against the New England Patriots. At Montrose High School, Snee was a two-time all-state selection, and a three-time All-Conference selection. He is believed to be the first NFL player ever to grow up in Susquehanna County, Pennsylvania. He was named the Regional Defensive Player of the Year in 1999. He was named Three-time All-Conference choice and a two-year All-Regional honoree. Snee played defense in high school and recorded 47 quarterback sacks in his three years as a starter on the defensive line. He led his team to the district title in 1997 and 1998. He totaled 101 tackles in his senior season and served as their team captain. Snee was a two-time All-Conference selection and team captain on the school’s basketball team. He played in the 43rd annual Big 33 Football Classic, featuring the top players from Pennsylvania and Ohio. Snee attended Boston College, where he played for the Boston College Eagles football team. He was a second-team All-America selection and an All-Big East Conference first-team choice by The NFL Draft Report in his final season at Boston College. In 2003, he started every game, including the San Francisco Bowl, at right guard, providing excellent blocking as tailback Derrick Knight ranked fourth in the nation in rushing with 1,721 yards. He started every game at left guard in 2002, helping the team finish third in the Big East in total offense (5,074 yards) and second in passing yards (3,010). Snee was third-team Freshman All-America selection by Sporting News in 2001 and was a member of the Big East’s All-Freshman team. He played in nine games, starting the final six contests. He made his first career start vs. Virginia Tech at right tackle before shifting to right guard for the Pittsburgh contest. Snee gave up his final year of college eligibility to make himself eligible for the NFL Draft. He made his NFL debut against the Philadelphia Eagles, where he helped Tiki Barber rush for 125 yards on nine carries, including a 72-yard score. He missed the final five games of the season after waking up the morning of the game against the Washington Redskins with an inflamed gland just beneath his jaw. He arrived at the stadium early, but there was no progress in his condition prior to the time the Giants had to submit their list of inactive players. The condition did not improve enough for him to play again in the 2004 NFL season. As a rookie in 2004, Snee started all 11 games in which he played at right guard, a job he won in training camp. Snee and the line provided enough run blocking for Barber again for him to rush for a then team record 220 yards vs. the Kansas City Chiefs. He also helped blocking against the Oakland Raiders and helped Barber rush for 203 yards, including a team-record 95-yard touchdown. His pass blocking enabled Eli Manning to pass for 3,762 yards, the 5th-highest total in franchise history. Snee also provided enough run blocking for Barber to rush for a franchise record 1,860 yards. He was then selected as a fourth alternate to the NFC Pro Bowl team. In 2005, Snee started all 16 regular season games and the NFC Wild Card Game at right guard. Against the Washington Redskins, the line allowed one sack and helped the Giants rush for 261 rushing yards, their highest total since they ran for 262 yards on Oct. 30, 2005. In the NFC Wild Card game against the Philadelphia Eagles, the line allowed one sack and provided enough blocking for the Giants to rush for 151 yards on 31 carries. He was later voted as third alternate to the 2006 Pro Bowl. Snee provided enough run blocking for the Giants offense to rush for 2,156 yards, the seventh-highest total in the NFL. In 2006, Snee started all 16 regular season games and the NFC Wild Card Game at right guard. Against the Atlanta Falcons, the line allowed one sack and provided enough protection for the Giants offense to gain 491 yards of total offense. Snee and the line allowed just four total sacks in a 5-game period from Sept. 30-Oct. 28. In week 17 Snee helped Tiki Barber rush for a franchise record 234 yards in a playoff-clinching win against the Washington Redskins. In that game Barber had three runs of 50 yards or more, two of them for touchdowns. In 2007, Snee started all 16 regular season games and the Giants’ four postseason games. He was an integral part of an offense that helped the Giants score 373 points (the fifth-highest total in franchise history) and compile 321 first downs (the fourth-highest total by a Giants team) and 5,302 yards (seventh in team history). 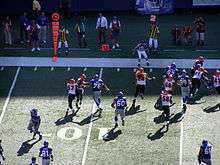 The line’s blocking enabled the Giants to finish fourth in the NFL in rushing yardage with an average of 134.3 yards a game. Snee also enabled the Giants rushed for 289 yards in a playoff-clinching victory against the Buffalo Bills, their highest total in 22 years. He also started every game in which he’s played (59 regular season and six postseason) at right guard. Snee enters the 2008 season with 48 consecutive regular season starts, the third-longest streak on the Giants behind David Diehl (80) and Eli Manning (55). Snee reportedly signed a new six-year contract extension to remain a Giant through the 2014 season. The deal has a base salary of $41.25 million and includes $17 million in guarantees. Snee also gets a $13.5 million signing bonus and can earn another $2 million in incentives. $23 million will be available in the first three seasons and his annual base average is $6.875 million. Snee's strong play in 2008 earned him his first Pro Bowl selection as one of the NFC's starting guards. Snee was selected to the 2013 Pro Bowl and had hip surgery after the event. In October 2013, Snee was put on the injured reserve list and was out for the rest of the season due to an injured hip. Snee announced his retirement from the NFL on July 21, 2014. Snee is the son of Diane and Ed Snee, and has three brothers: Edward, Daniel and Shaun. He graduated from Montrose Area Jr./Sr. High School in Montrose, Pennsylvania in 2000. He married Kate Coughlin, daughter of former New York Giants coach Tom Coughlin. They have three sons: Dylan, Cooper and Walker. He now is a lineman coach at Indian Hills High School in Oakland, NJ, where they made the semifinals in his first season in 2015. ↑ 76 CHRIS SNEE G Archived July 4, 2008, at the Wayback Machine. ↑ "Giants' Chris Snee To Have Hip Surgery After Pro Bowl". CBS News New York. Retrieved 18 January 2013. ↑ "Giants Guard Chris Snee Placed On IR, Will Miss Rest Of Season". CBS News New York. Retrieved 4 October 2013. ↑ "New York Giants OL Chris Snee Officially Retires from NFL". ↑ Rosenthal, Gregg (July 21, 2014). "New York Giants guard Chris Snee retires". NFL.com. Retrieved 2014-07-21. ↑ Lapointe, Joe. "Football Family: Chris Snee's Wife Is Tom Coughlin's Daughter," The New York Times, Sunday, December 28, 2008.